Press Bay Alley is located on West Green Street, a short walk south of The Commons, and just one block to the west of Green Street’s Transit Hub. Press Bay Alley is also conveniently located near the Green Street and Cayuga Street parking garages. Press Bay Alley is downtown Ithaca’s latest retail development. 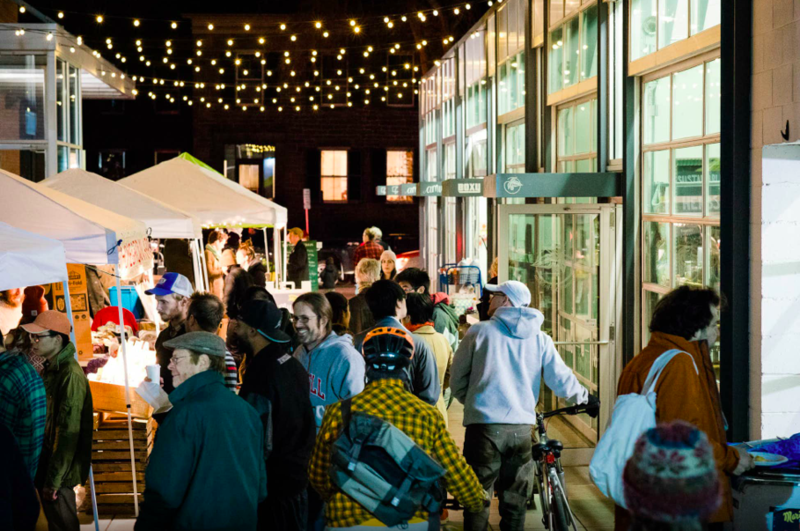 It’s a unique downtown shopping experience consisting of a series of micro-retail spaces in a converted row of storage bays that borders on the former Press Bay where the Ithaca Journal newspaper, the community’s daily newspaper, was printed. The Press Bay warehouse is presently home to The Ithaca Generator makerspace and to micro-retail spaces Amuse modern cottage industry, The Press artisan expresso bar, Sweet Melissa’s, and Bramble community herbal apothecary. Press Bay Alley seeks to serve as a signpost for how cool downtown can be. It is clearly visible to motorists who pass through as they approach downtown from the west. The Alley is a fabric of things that weaves together to create a vibrant and engaging environment by combining the energies of many entrepreneurs, makers, and doers in one place we build a more exciting and resilient environment than what would be with a single large tenant. Press Bay Alley is also home to Circus Culture, the region’s only circus performance school. Soon (in Summer 2018), Press Bay Alley will be connected with Press Bay Court which will include another series of micro retailers including Gee June Bridal, Hair Color Art, and One Ring Donuts. Wizarding Weekend is a three-day community and fan driven celebration of all things Magic. Held annually in October, it has become an Ithaca tradition for the streets of Downtown Ithaca to morph into a wizarding wonderland just before Halloween. Thousands of guests show up each year to participate in Quidditch matches, a Magic Ball and life-size chess in the street, or to shop for magic related items and foods at dozens of vendors on site and enjoy the variety of live music. For additional details about this magical affair, visit www.wizardingweekend.com. If you’re visiting for the holidays, stop by Press Bay Alley for its Holiday Farmers’ Markets held in November and December. You’ll find a grand selection of locally produced veggies,cheeses, breads, pies, syrup, honey, beverages, eggs, and other culinary bounty, plus hand-crafted holiday gifts! Press Bay Alley and Press Bay Court are located off of Green Street, where visitors can find movies, shopping, dining and more. 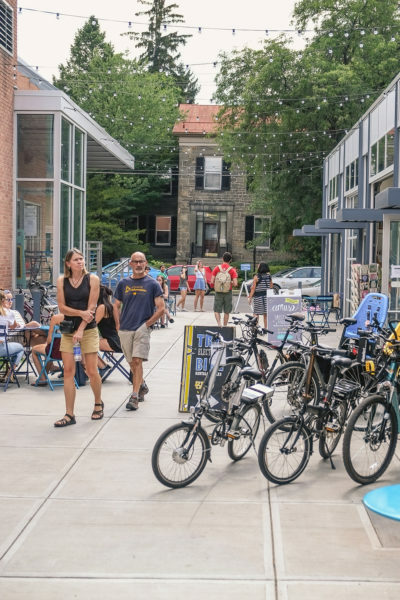 On Green Street, you can catch one of the latest flicks or a classic at the independently owned movie theater Cinemapolis, enjoy a delicious Italian soda or ice cream at Green Street Pharmacy, or purchase the latest in preteen and teen wares from the national chain Urban Outfitters. Green Street is also home to the Tompkins County Public Library where visitors and locals can experience the joy of reading, the power of information and the strength of community connections. Located behind the Tompkins County Public Library, Creek Walk is the perfect place to connect with nature in our urban setting. Take a stroll or bike ride, enjoy a jog, or simply stop and relax at this urban pedestrian trail overlooking the area’s scenic Six Mile Creek. The gardens along Creekwalk are planted with gorgeous shrubs, perennials, bulbs and annuals, including vines on the fence, hibiscus, phlox and coreopsis. This area offers a slice of calm and serenity in our bustling urban core. Cayuga Street and Clinton Street by the bridge.